Statement of Significance: Outstanding Federation mansion. Good example of Federation Arts and Crafts Style. Distinctive design with long sweeping bellcast roof, central entry feature and projecting balcony above. Excellent condition. Original interior and landscape elements. State and local significance. Physical Description: Federation mansion. Attic storey in high pitched slate roof. Sweeping bellcast form with large gables on each elevation. Tuck-pointed face brick walls with extensive roughcast render. Verandahs continue around most of perimeter. Projecting entry with round arch opening, sandstone dwarf wall and balcony above. Shingled gable over. Fine timberwork to verandah and balcony. Original doors and windows. Much of the interior is also original. Original gates with new low, symmetrical fence. Well planted grounds, retaining some original plantings. Modifications: Rear verandah enclosure. Fence. Historical Notes: Mrs Anne Roberts purchased the 1.25 acre block of land in 1897. Her husband, Oscar Roberts was joint owner of Fairfax and Roberts, jewellers. He was also a Councillor of Hornsby Shire Council. He died in 1922. The house was sold to Frederick Watson of Hornsby in 1928. Comments: Heritage listed in HSLEP 1994, Gazetted 22 July 1994. Two inventory sheets for house and garden. Mount Errington is a neighbourhood on the western side of the suburb of Hornsby, in Hornsby Shire. It is named after the stately home built there by Oscar Garibaldi Roberts. 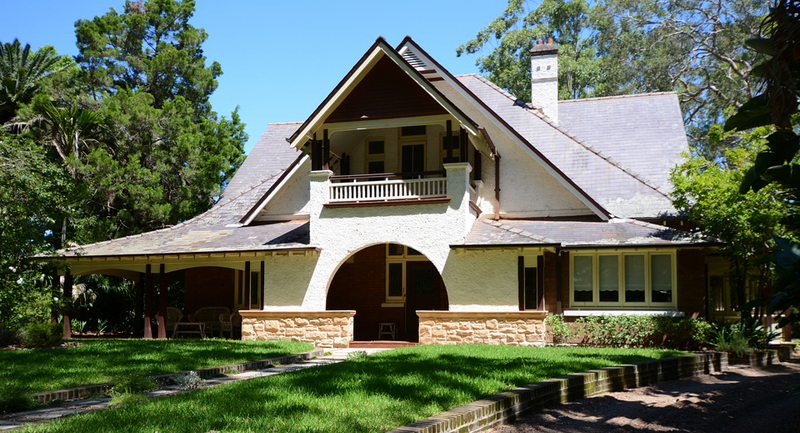 In 1897, Roberts’s wife, Anne, purchased 1¼ acres (5058 square metres) on the corner of Rosemead Road and Dural Street, which was the highest point in Hornsby. The two-storey house was built in the Arts and Craft style between 1898 and 1899. An exceptional landholding steeped in history, this exquisite period masterpiece is quite simply without equal. Exclusively positioned amidst sprawling park-like level grounds, ‘Mount Errington’ circa 1899 is one of the few remaining representatives of the classic ‘Arts and Crafts’ movement in the area. Embracing all the charm and romance of a bygone era combined with modern updates to cater for contemporary family living, it takes pride of place just moments from the many conveniences and lifestyle choices Hornsby has to offer. A world away from today’s hectic lifestyle its grand interiors, stunning wraparound verandah and sheer proportions provide the ultimate family sanctuary with boundless potential to further enhance as desired.